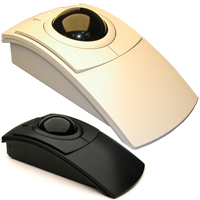 The PC-Trac from Clearly Superior Technologies is a robustly built trackball line offering options and features not readily available in other trackballs. The low profile of the PC-Trac acts as a natural hand rest mirroring the natural contour of your hand and is designed to easily accommodate both right and left-hand users, as well as different size hands. PC-Trac basic models offer both "middle click" and "drag lock" functions (see the Features for more details.) 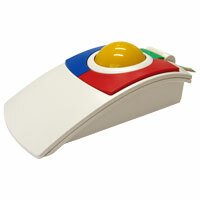 On the Pro models this button only supports "middle click" but there is downloadable software available which enables users to customize their trackball features. There is also a 5-button model which offers 2 input jacks for the connection of optional external switches. Clearly Superior Technologies just added a cool factor to their line of L-Trac high-performance trackballs. The new L-Trac GLOW offers all the same functions of other L-Trac models but with a unique new look--a backlit translucent ball that glows a vibrant blue. The L-Trac GLOW uses the same quality components that have enabled Clearly Superior Trackballs to develop a reputation for reliability and performance under demanding conditions. The precision-ground ball and mirror-finished rollers deliver a smooth-as-silk feel and effortless control. The ball on the L-Trac GLOW is 28% lighter than the traditional ball used in other L-Trac models, resulting in a reduced load on the fingers. The L-Trac GLOW features high performance laser optical tracking with selectable resolutions of up to 1600 CPI. Button selectable resolutions enable rapid changes of sensitivity while maintaining full control of the trackball. The high performance laser navigation system is capable of tracking at greater than 20 inches per second. This means the user can fly around the screen with a flick of the finger or snap from one side of the screen to the other with a healthy flick of the arm. Either way, this precision, high performance pointing device produces predictable, quick and precise motion that becomes intuitive in a few minutes of use. The scroll wheel is smooth and readily accessible, located above the center button. The design is completely ambidextrous, accommodating either right or left-handed users. The extra large ball and contoured profile allow for easier control and accommodate hands of all sizes--from children's to adults'. The lighter weight of the ball on the L-Trac Glow makes it a good option for children or those who have limited strength in their fingers. Performance users can expand their command options by selecting the CST2545-5WGL-RC. This model includes jacks to connect two additional external switches. 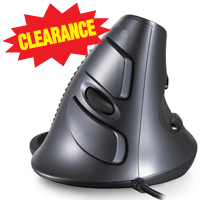 The KidTrac trackball from Clearly Superior Technologies may be look like it is for children but users shouldn't be fooled by outward appearances. 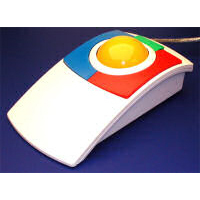 The bold bright colours—Yellow trackball with Red, Green and Blue buttons—is just a disguise for a highly functional trackball with capabilities suited to all ages. Unlike most trackballs on the market, the high density 2.5" diameter phenolic trackball in the KidTrac has significant inertia. This provides far more tactile feedback than that normally offered with other trackballs, ensuring smooth response to even a light touch and requiring minimal dexterity of the fingers. 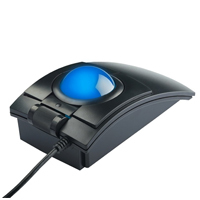 Since the entire hand can be engaged in performing the trackball movements, the PC-Trac is a good solution for those who may have weakness or damage to the fingers, or for those who are seeking to avoid potential Repetitive Strain Injuries. Unlike some other trackballs, the trackball in the KidTrac is also safely secured in the housing to ensure that it cannot be easily removed, either by accident or deliberate action so missing trackballs or broken windows are not an issue. Since the low profile of the KidTrac housing acts as a natural hand rest, mirroring the natural contour of your hand, it can also reduce the risk of the wrist being inappropriately positioned and being injured as a result. The special 'Ambidextrous Trackball' feature allows switching from left to right-handed use by simultaneously pressing all 3 buttons, without the need to change system settings. Users with vision limitations can especially benefit from the extra-large brightly coloured design which serves as an aid to clearly identify the button locations and functions. The light activation force and large dimensions of the buttons also mean that anyone with limited strength will be able to perform clicks as easily as any user. Users with motor function limitations may be interested in the Switch-Adapted version of the KidTrac which has three jacks for the connection of accessibility switches to provide easier access to the button functions. 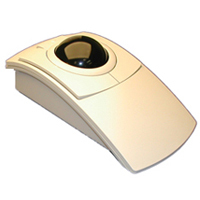 If more versatility is required, purchase the PRO model which converts the middle button back to the familiar middle click action, and offers downloadable software which enables users to reconfigure the trackball button actions to their personal preferences. 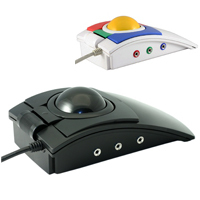 The PC-Trac Switch Adapted trackball from Clearly Superior Technologies offers alternative clicking options available to users who may struggle with fine motor control. It features 3 jacks which permit the attachment of external control switches which can be placed where best suited to the needs of the individual user. 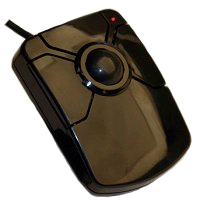 All of the features of the basic PC-Trac—high density 2.5" diameter phenolic trackball for tactile feedback and smooth response, light touch buttons, safely secured trackball, low profile housing, ambidextrous feature, 'Dynamic Acceleration', Drag Lock and Scroll Lock—are available on the Switch Adapted version. The extra-large size, low activation force and large dimensions of the buttons also mean that anyone with limited strength will be able to perform clicks as easily as any user. 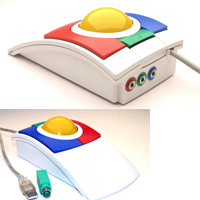 Users who have vision limitations may wish to consider the high visibility KidTrac Switch Adapted or the high performance L-Trac Switch Adapted versions which feature white housings with yellow trackballs and red, blue, and green buttons. Looking for the ultimate trackball which offers the perfect combination of high-precision and ultra-responsive performance in an incredibly durable design? The L-TracX has user-selectable resolutions of 800, 1600, 2400 or 3200 CPI (counts per inch) which can be adjusted 'on the fly' as needed. 'Dynamic Acceleration' provides an ideal combination of extreme accuracy and accelerated movement at all resolutions by factoring the speed of rotation into the cursor movement algorithm. The optional scroll wheel is smooth and readily accessible, located above the center button. It uses a 1000hz polling rate and provides a maximum acceleration of 30 Gs, ensuring the fastest performance. All buttons are fully programmable using the Superior-X button control, and are rated at 5,000,000 operations with built-in over-travel protection. This performance coupled with the proven contour of the L-TracX makes these trackballs clearly superior for demanding users including graphic intensive users and gamers. CAD users love it because you can drag a line one pixel even on today's high resolution displays of 1900X1080. Then, with a button stroke, they can fly around the screen to get general tasks done. Gamers have called it an 'almost unfair advantage', citing the fingertip control and precision, high performance tracking. Designed to minimize the effects of contamination build up and the resultant degradation of performance, this high performance laser trackball uses highly polished stainless steel rollers. It has been found by CST that the 'ruby ball sliders' used in most optical trackballs, cause performance degradation when 'gunk' builds up on them. The L-Trac uses mirror polished stainless steel rollers do not readily collect unwanted material and are easily cleared by spinning the ball rapidly. The Dupont Delrin bearings are embedded with teflon and internally coated with a lifetime lubricant making the feel of this trackball extremely smooth and it's reliability very robust. The stainless steel rollers are extremely tough and give a super smooth feel. The standard model (CST2545X) comes with all the above features. The Professional model (CST2545-5XW) includes the scroll wheel and 2 extra button jacks to add 2 more buttons to your LTracX.